Love the stonework, hate the wooden benches. And then there’s that white pavilion – about which few will be neutral. So what do you think? – as a design, as a public space, as the definitive gathering space for the city. And as a name. Can we do better than ‘Courthouse Plaza’? That white thing on the corner ruins the entire project. It block the sightlines towards the courthouse, and has no feasible function that I can discern. I’m generally very accommodating of design choices in public spaces, but this is a serious exception. I can only assume the thing will soon sport a big ugly corporate logo. Well, I think the stonework is a bit bitty for the size of that space. I like the benches but I’d like them better if they were in stone so you could tell if they’re dry when you go to sit down. I assume the white thing is a bus shelter in the rain and a tech platform for events so I’m neutral on that. But I’m wondering why nothing was built under such a large space, although I know that was a discarded gallery option. What exactly is the pavillion for? It looks too narrow for a gathering of any kind. Definitely two thumbs down on the white thing. This place falls well short of its potential. It’ll be pretty good when full of people but most of the time is not inviting enough to attract enough people to make it inviting in a vicious cycle. Protests will have a better aesthetic than events which will come with a clutter of pop-up tents etc. But to be fair, any square or plaza surrounded on three sides by busy roads doesn’t have a hope of being a place one would want to linger for long..
Jan Gehl built a half-century long career on urban design observation. He made the key point that public squares overridden by cars, or dominated by active streets for cars at the edges, are not as successful as plazas lined with people attractors like cafes, which also tend to block the sound of traffic. He even measured “staying activity” and has the higher human use stats from many cities to prove his point. Haven’t experienced it in person yet, but based on the photos, don’t like the paving pattern, i do like the benches. I presume the white pavillion is to provide some weather protected seating? Like that it might provide shade in the summer, but as a gesture seems bizarre to me. Would love to know more about it’s intent/purpose. I would have preferred to see a lot more programming and some trees somewhere too. I understand that the plaza is desired as a large gathering space for events, but for everyday spaces where people could hang out and play chess, things for children to interact with while parents could sit and keep a watchful eye out, an attractive place to have lunch. These things could all be designed to be semi-permanent and moveable to accommodate the need for a clear plaza for large gatherings. All the benches can be moved. Further to my comments above, I feel like it has been designed primarily as a single purpose space (to accommodate large gatherings) at the expense of being a vital part of the urban fabric used on a daily basis by the people who live, work and visit the area. Some large movable trees would help soften the plaza and could be shifted to shape space for certain events. The furniture is nicely detailed but again could have been movable. I worked on a project in NZ (Lower Brougham Street) where we designed a suite of large scale movable furniture for a plaza in front of the New Plymouth library that could be shifted and locked in place, the flexibility created endless site programming opportunities. Can’t understand the continued avoidance of colour in this city regarding furniture or otherwise. The grey paving while sympathetic to the historic architecture, does nothing to brighten up the city on the endless bleak winter days we encounter especially this week. On trees, permanence rings true for generations. Moveable containers indicate a fundamental dedication to the temporary, the plopped and the impermanent, which is incongruous to the architecture which will last for ages. We lost some magnificent Atlas cedars (rare enough in this town) in front of the building. The excuse was that they were diseased. I would sure love to see the arbourist’s report posted on that. My guess is that they used “trees in decline” to make it more convenient to build hardscape in their place. In their place we got some exceedingly small caliper trees along Hornby which will take a generation to provide any decent shade — or even to be noticed. Thumbs up on the fact that we now have a decent, purpose-designed gathering space to replace the field of bark mulch. I hope it has adequate electrical and water services for large gatherings. The final product is a lot better than what we had… a true piazza in the heart of downtown. I predict that it will become the home to many events and festivals in the years to come. When not used for this purpose, moveable bistro and chairs will be put out for people to sojourn at during the summers. Remember this location has a high concentration of food trucks with customers looking for seating. The DVBIA will be an active player to bring this site to life in spring 2018 with a cast of other players. And yes, we need a better name for this place. Dal Richards Plaza or a First Nations name to acknowledge and recognize the First Peoples of this land. It looks nice; a flexible public space. Nobody’s going to look at it and weep with joy, but it gets the job done. Not a fan of the pavers, though – too finicky to maintain. Concrete or much simpler square pattern would have been better. Its success will depend on whether it is programmed with any frequency. If there’s nothing going on, as others have noted, it’s just a big empty space. The paving is rather busy – but is softens the vastness of the space. 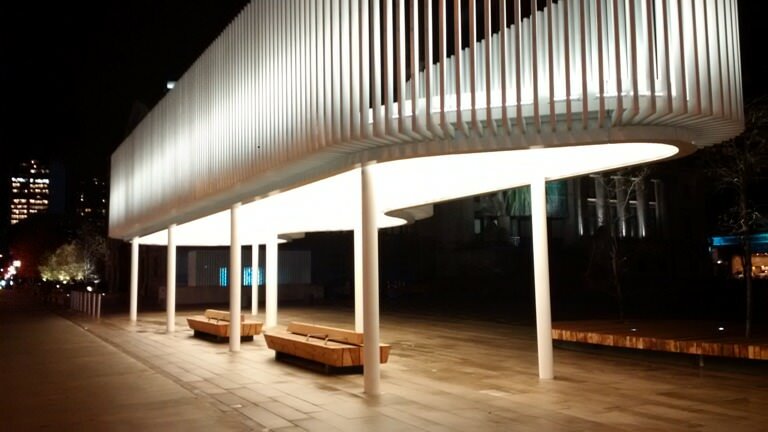 The white pavilion looks better at night and provides a bright spot on the darkened plaza. The tynes on the roof provide an interesting play of light at night when walking on the other side of Howe (Nordstrom side), with the curvey side interweaving with the straight Howe side. It’s certainly different than the North Plaza as it existed before the age of protestors. I remember office workers lying on the grass during lunch breaks. Click through the link for the full size pic. PS – some coniferous trees (like the 2 flanking trees that were removed) would extend the greenery into the winter months, rather than the lifeless twiggy look we have now. Space constraints in the paper meant that I could only briefly allude to the many challenges the design team (of which I was initially a part) faced with the City of Vancouver as a client with a limited committed budget and, frankly, an even more limited vision for the future possibilities of this major public space. Faced with those constraints of both budget and vision, the resulting design, while not perfect by any means, achieves many of the goals the designers had for this space, and is immeasurably better than what was there before. Vancouver finally has a central public outdoor room. Those constraints have inevitably produced some compromises. For example, many people wonder about the pavilion structure along the east side of the square: It was originally intended to be partially enclosed and house a food & beverage services kiosk, and possibly a tourist info centre, which would have helped animate the space and draw people in. The City quashed that suggestion. 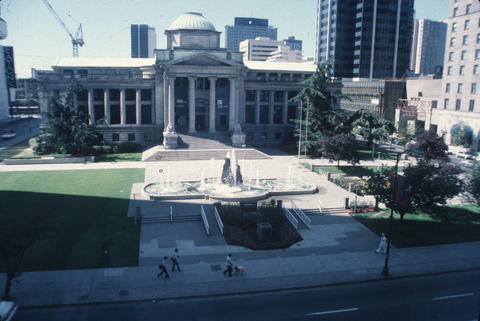 The designers also advocated for the critical importance of providing back-of-house space (possibly located within the lower floor of the adjacent former courthouse building, now VAG), essential for storing mobile outdoor furniture, event equipment and maintenance tools that successful urban public spaces need in order to function effectively. This too was rebuffed by the City. It remains to be seen how well the square is programmed, operated and maintained, especially while the VAG continues to occupy the adjacent former courthouse building and turns its back, quite literally, on the space. In fact, one can read this redesign as an interim stage of the site’s redevelopment as a more fully engaged part of the city, which will only be really fulfilled if/when the VAG relocates and the courthouse building reengages with the public space it fronts. And that rather weird row of metal bollards/seats that snakes across the space? That was imposed on the design by the City, which insisted on a physical barrier to prevent any vehicles driving over the underground VAG storage vault roof. This concern could have been addressed through the permitting regulations that govern use of the space by any event vehicles, and with a simple graphic indication in the plaza surface. This new plaza goes a long towards giving Vancouver what it has never really had: a major, flexible, public square at the heart of the city that serves as the city’s central gathering space. How we citizens use it is up to us. Very interesting to note that none of the the benches shown in the completed (?) plaza are Fully Accessible for many Persons with Disabilities and Seniors, hardly an oversight yet typical of far too many COV/VPB projects. No high handrails/armrests to push off from and seating that is to low and with no backs. What we’ve been handed is another example of how the COV/VPB continues to commercialize Public space in order to feed the City Hall machine. To no surprise the COV did not provide electrical hook-ups requiring vendors like food-trucks and carts to stop burning fossil fuels to flog their wares. Of course as long as you can fool people into believing your Green anything goes. Since opening on Great Northern Way Mountain Equipment Co-op has taken out repeated permits from the COV for fossil-fuel burning food trucks to park right outside their doors on GNW and the COV has allowed food-trucks to park in a no parking zone even against the flow of traffic. If MEC was truly Green they could have provided electrical connections for food-trucks in their expansive and very busy employee parking lot with limited Handicapped parking. Whether they are patronizing the food-trucks or the restaurants/cafes at VCC KEC the numbers of MEC employees that can’t cook for themselves is staggering.